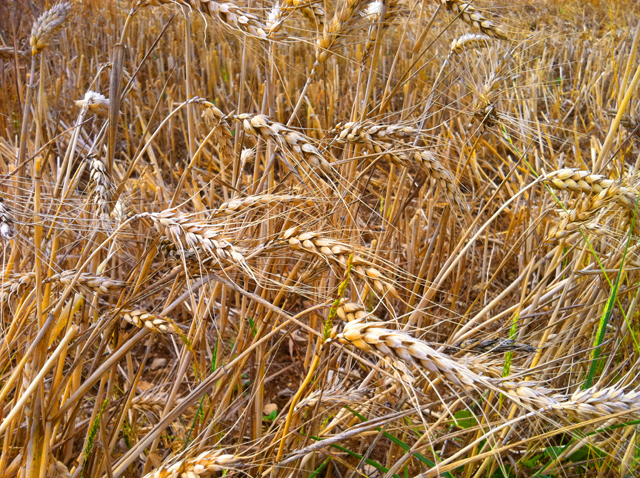 Like many of you, I grew up singing a national anthem about something I’d never seen: amber waves of grain. Not only had I never experienced them first hand; I certainly had no idea why one would sing an impossible melody to praise them. But I “get it” now. They are beautiful. They are necessary. They are the link between our survival and the earth we consider to be our domain. 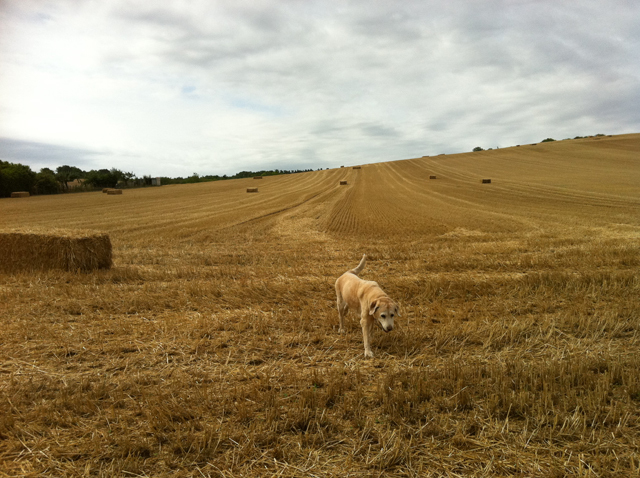 Not every day, but as often as possible, we walk by this field. Every time, it’s a little different. The shadows fall just so. The colors shift toward warm or cool. The clouds are low, thick or non-existent. The gold is a little more golden. The ground a little harder. It’s worth it to revisit it again and again and again, no matter whose home soil it’s on. And so we do. I DO love this. . . the grain. . . and the sky! . . . the sky! Reminds me of that “famous” picture of you, more or less standing in the exact same spot. Lovely. I do love that even though you can take a girl out of her country… you can never take her country out of the girl…..happy belated 4th my american sister! 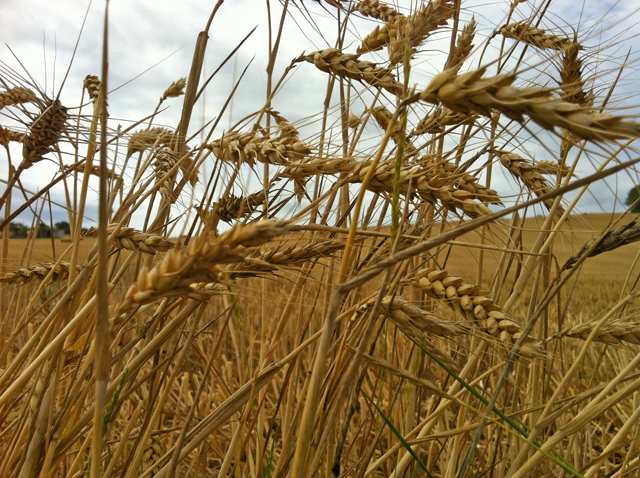 The stalks of wheat are also considered a blessing in a home; it is customary to have a few somewhere on a wall, in a vase – it’s good luck, ça porte chance! We could use some of that…we have a rabbit too; perhaps her feet will bring us good luck too, still attached to the animal of course. Hi Luna i’m coming soon…Nana. 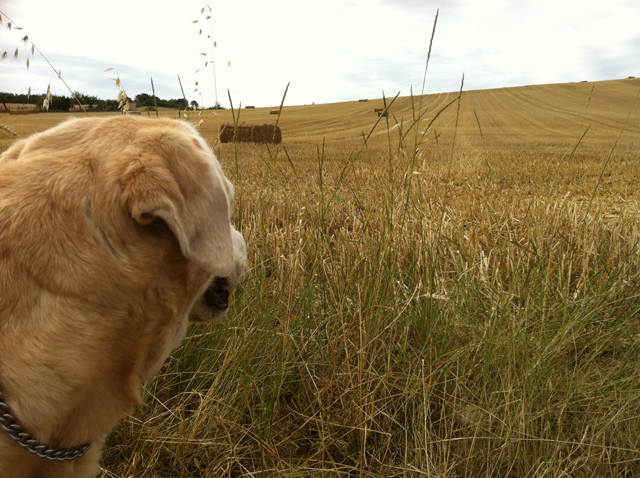 I love the picture of your dog looking out over the field. It’s like seeing it through his/her eyes! I think she dreams of that field.